Originally published under the title "The Mirage of the Mideast's 'Moderate' Alliance." These camps are identified in a variety of ways. But the most usual depiction notes a tight, hierarchical bloc of states and movements dominated by the Islamic Republic of Iran. An alliance of "moderate" states opposed to Iran and including Egypt, Saudi Arabia, Jordan, United Arab Emirates and Israel is seen as the principal adversary and barrier to the hegemonic ambitions of the Iran-led bloc. Some depictions also posit the existence of a smaller alliance of states and entities associated with Muslim Brotherhood-style Sunni political Islam (Qatar, Turkey, the Hamas enclave in Gaza). The picture is then completed with the addition of the rival Salafi Islamist regional networks of al-Qaida and Islamic State. This picture, in its coherence and elegant simplicity, is pleasing to the eye. It posits a powerful regional alliance, of which Israel is seen as a member. Whether the picture conforms to reality, however, is questionable. Specifically, while the blocs led by Iran and the transnational networks of the Salafi jihadists are certainly observable, it is far more doubtful if anything resembling an alliance of "moderate" states really exists. The so-called 'moderate bloc' consists of countries that disagree bitterly on important issues. Iran stands at the head of an alliance that has made significant gains across the region over the last half decade. Its Lebanese client, Hezbollah, is increasingly absorbing the institutions of the Lebanese state. Its clients in Yemen (the Ansar Allah movement or Houthis) control the capital and a large swath of the country. President Bashar Assad of Syria is no longer in danger of being overthrown and now dominates the main cities and coastline of his country, as well as the majority of its population. In Iraq, the Shi'a militias of the Hashd al-Shaabi are emerging as a key political and military player. The Iranian alliance is characterized by a pyramid-type structure, with Iran itself at the top. In the Islamic Revolutionary Guard Corps, Tehran has an agency perfectly suited for the management of this bloc. As the Syrian war has shown, Tehran is able to muster proxies and clients from across the region and as far afield as Afghanistan and Pakistan, in order to deploy them in support of a beleaguered member of its team. This is what an alliance looks like. By contrast, the so-called moderate bloc in fact consists of countries that disagree bitterly on important issues, while agreeing on some others. Russia, Syria, and Iran display far more unity of purpose than the Sunni governments opposing them. Observe: Saudi Arabia was the first country to express support for the military coup in Egypt on July 3, 2013. The friendship between Cairo and Riyadh looked set to form a Sunni Arab bulwark against both the Iranian advance and the ambitions of Sunni radical political Islam. That is not the way it has turned out. On a number of key regional files, the two are now on opposite sides. In Syria, Saudi Arabia was and remains among the key supporters of the rebellion. The Assad regime, as a client of Iran, was a natural enemy for the Saudis. The Egyptians, however, saw and see the Syrian war entirely differently – as a battle between a strong, military regime (like themselves) and a rebellion based on Sunni political Islam. In November 2016, President Abdel Fattah al-Sisi said that Assad's forces were "best positioned to combat terrorism and restore stability" in the country. Sisi identified this stance as part of a broader strategy, according to which "our priority is to support national armies... and deal with extremist elements. The same with Syria and Iraq." This places Egypt and Saudi Arabia, supposedly the twin anchors of the "moderate" bloc, at loggerheads in two key areas. Egypt and Saudi Arabia are at loggerheads in Syria and Iraq. In Libya, in line with this orientation, too, Egypt, along with the UAE, fully supports Gen. Khalifa Haftar and his forces in the east of the country. Saudi Arabia, by contrast, is largely indifferent to events in that area. In Yemen, meanwhile, the Egyptians have offered only halfhearted support to Saudi Arabia's war against the Houthis. This, in turn, relates to a further key difference between the two – regarding relations with Iran. While the Saudis see the Iran-led regional bloc as the key regional threat to their interests, the Egyptians are drawing closer to Tehran. The two countries have not had full diplomatic relations since 1980. But the Iranians acknowledged their common stance on Syria, when Iranian Foreign Minister Mohammad Javad Zarif specifically requested of John Kerry to invite Egypt to send a delegation to talks on Syria in the Swiss city of Lausanne on October 15, 2016. In the same month, to the Saudis' fury, Cairo voted for a Russian-backed UN Security Council resolution allowing the continuation of the bombing of rebel-held eastern Aleppo. In turn, when Saudi oil giant Aramco announced the cessation of fuel transfers to Egypt, Sisi declared that "Egypt would not bow to anyone but God," and the government of Iraq agreed to step in to make good the shortfall, at the request of Iran and Russia. 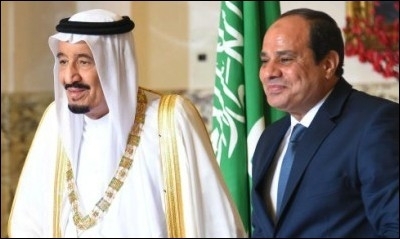 So the core Egyptian-Saudi alliance is fraying. Israel views its chief concerns as Iranian expansionism and Sunni political Islam; Egypt is concerned only with the latter of these. Saudi Arabia meanwhile, is increasingly concerned only with the former. Representatives of King Salman met late last year with officials of the Muslim Brotherhood in Istanbul, London and Riyadh. On the agenda was the possible removal of the Brotherhood – Egypt's key enemy – from Saudi Arabia's list of terrorist organizations. Salman has taken a view of Sunni political Islam far more forgiving than that of his predecessor, King Abdullah. This, in turn, has led to Saudi rapprochement with Turkey, whose leader despises the Egyptian president for overthrowing his fellow Muslim Brothers. Thus, the three main corners of the "moderate" alliance are drifting in different directions – Riyadh appears headed toward rapprochement with political Islam, while maintaining opposition to Iran. Egypt is moving toward Russia, Syria, Iraq and a stance of support for strong states. Only Washington can bring the disparate enemies of Iran and Sunni Islamism into a united front. Israel will seek to maintain good relations with both Saudi Arabia and Egypt (and with smaller players in the "alliance," such as Jordan and the UAE), on the basis of areas of shared interest and concern. But any notion of a united bloc of Western- aligned countries standing as a wall against Iranian and Sunni Islamist advancement is today little more than a mirage. What might change this would be the return of the superpower that was once the patron of all three countries – the United States. Alliances work when they have leaders. Only Washington could refashion the disparate enemies of Iran and Sunni political Islam once more into a coherent unit. It remains to be seen whether the Trump administration is interested in playing this role.